KANEX Stored Pressure Foam extinguishers are ideal for fires involving volatile liquids and freely burning materials such as paper, cloth, wood and furniture. Note : Mechanical Foam extinguishers are not suitable for fires involving electrical risk. 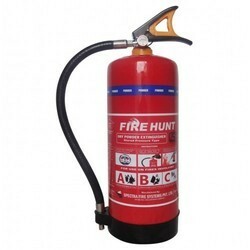 Being a foremost organization in the industry, we are actively engaged in trading the best quality range of Foam Fire Extinguisher.